Mobile gamers acquired through organic social channels have a higher retention rate of as much as 67 per cent. 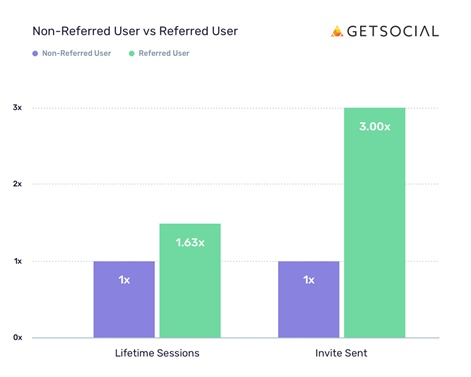 That's according to viral user acquisition tools provider GetSocial, which also reports that such players have a 63 per cent higher lifetime session count when pitted against non-referred players. The anonymised data was taken from 60 million mobile gamers which have integrated with GetSocial’s technology between February 1st and August 31st this year. GetSocial's technology powers social features in games and is used by developers and publishers such as Sega, Super Evil Megacorp, Fluffy Fairy and Ubisoft. The report follows another one that GetSocial posted in March in conjunction with Sega which claimed the best way to attract and retain players came through non-paid social channels. "This data builds on the insights we shared earlier this year, based on our collaboration with SEGA for Sonic Forces: Speed Battle,” said GetSocial CEO Jeroen Bouwman.